>Takes bones out of bank and buries into the floor. >Automatically registers the current host and will join their house. Once offline will re-register another host. >Uses phials to un-note bones so have cash and noted + un-noted bones in your inventory. >Can use your own house with burners, start with noted bones, noted marrentill, tinderbox, 2 united marrentill and the rest bones in your inventory. >Unnoted 2 marrentill and bones with phials, goes back into house, lights burners and then uses bones on altar. >This isn't used much anymore but I added it for those who want to use their own private portal. There is a separate anti pattern page to help keep you different from everyone else, I suggest you change the settings. 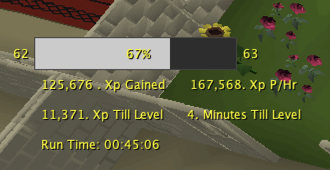 Prayer 74-85 in roughly 10 hours of botting in 3 days. I got myself 99 prayer with this script! Someones rocking the signature below! Nice to see a prayer script that incorporates all options now. Awfully specific how you're banking for chaos altar though. Is there an option to manually use bones? In Runelite it's really easy because there's the menu entry swapper. Wym awfuly specific? If you mean dying to the wines it’s the quickest and safest way without writing a pk bot to tank pkers. Doesn’t look like the SDN has compiled, will take a look when I’m home I probably forgot to push my commit. Is there an option to manually use bones? Also wym manually use bones? If you’re doing it manually you wouldn’t need the bot? If you mean not on an altar, yes I just forgot to add it in. You’ve only run it for 36 seconds so doubt it’s done a whole inventory and left the house ready to restock at phials in 36 seconds. Also make sure you have coins and noted bones in your inventory. Btw if you delete your cache you need to reload the cache otherwise everything will return null. There’s currently an issue with some scripts no starting, the admins are looking into it. Currently running locally due to the issue above but heres a proggy. its normal the script logsout after lvl up? 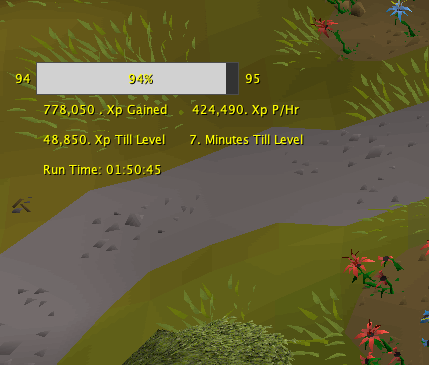 The script doesn’t log you out, if you’re logging out you’re either dc’ing or 6 hour limit or something else. No code in the script which logs you out. the thing is. when i lvl up at alter. it wont push a new bone to the alter. so it automomatticly logout because doin nothing. I’ve done 2 levels today 92 and 93 and it’s cleared it both times. I've been making tweaks to it all day, I'm currently going for 99 with this script. Started at 60 so hopefully I'll make it but should work once it's updated in ~10 minutes. It was originally only set to use the bones on the altar if it was next to the portal you see to stop it spamming the altar whilst next to it.